Kelapo recently attended the Fancy Food Show in San Francisco and we were named 1 of the Top 5 Trends From The Fancy Food Show! We were so excited to be included among the Top 5 by the Trendspotters: Stephanie Dean, Sunset Magazine, Dana Goodyear, The New Yorker, Nancy Wall Hopkins, Better Homes & Gardens, Kara Nielsen, CCD Innovation, Evan Orensten, Cool Hunting, Jennifer Pelka and Ruth Reichl, Gilt Taste, Denise Purcell, Specialty Food Media, Kalena Ross, Blackboard Eats, Stephanie Stiavetti, contributor to NPR, KQED, Huffington Post, Susie Timm, Girl Meets Fork, and Joanne Weir, PBS television host, cookbook author, chef. From flavoring scones to jams to ice cream to being used as a basis for waters or oils, coconut was everywhere at the Fancy Food Show. 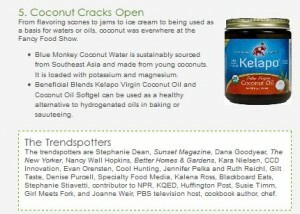 Thanks to all of the trendspotters for including Kelapo!